This claim will be judged TRUE if by the end of the Mars Exploration Rover mission (MER) the rovers have found geological evidence of liquid water having once existed on the Martian surface, and FALSE if the mission ends with no such discoveries. Currently, the atmospheric pressure on Mars is below the triple point of water. This means that liquid water is a physical impossibility. Attempts to create computer models of the ancient Martian climate have been unable to find any way for there to have been liquid water. Some scientists, however, argued that a large eruption of several major volcanoes at once might have raised the pressure and temperature for a brief period of time to a level where some liquid water would flow. The Martian surface is sometimes divided into two regions, called Syrtis and Acidalia. Syrtis incorporates roughly the southern half of the planet, and consists of rough highlands which are of basaltic composition. Acidalia, the northern lowlands, seems to be of andecitic composition. This is odd for two reasons. First, basalt is denser than andecite, meaning that the relative altitudes are surprising. Second, on Earth andecite only forms in the presence of liquid water. This has lead some people to conjecture that the Acidalia materials are actually weathered basalts. Hopefully, the Mars Exploration Rovers will be able to find enough Acidalia material to test this theory. The two MER landing sites are in Gusev Crater and Terra Meridiani. Gusev has been proposed as a probable paleolake site; it is a large crater with what appears to be a riverbed leading into it. There is even something that looks like a river delta! The bottom of the crater is covered in sediments. Some scientists suggest that this may be the result of flows of gasses of varying densities rather than water; nobody is really sure. The area around Gusev is heavily cratered, and we hope to be able to find ejecta materials from both Syrtis and Acidalia sites. Right on the edge of our landing elipse for the MER B rover, which is going to Gusev, there is a junction of three different types of surface feature; with a bit of luck we will be able to find a lot of great stuff from this site. Terra Meridiani is an area that some scientists think used to be an ocean. It is known to have coarse-grained hematite; this is the strongest evidence for water on ancient Mars, as on Earth coarse-grained hematite can only form in the presence of liquid water. Since all our data on the region is from the air, this is not considered sufficient. Studies of the hematite in situ may well be sufficient to confirm the former presence of water, but they might not. Both sites are on the boundary between the Syrtis and Acidalia regions, and we hope to analyze material from both. I apologize for not having any links to give you, but I've learned most of this directly from various Mars experts. The previous merh2o judge's statement has some restrictions on the judgment of the claim, and I want to share how I expect to interpret them. My intent with these interpretations is to give greater weight to the terms of the claim than to the terms described in the judge's statement where I feel they may conflict. The judge's statement requires an announcement "by the MER teams". However, public releases of information are not generally attributed directly to the teams. I will consider press releases by NASA to satisfy this requirement. The judge's statement requires "conclusive" evidence, while the terms of the claim do not have such a strong modifier. "Conclusive" is not really a scientific category of evidence, rather it is an informal way of expressing a judgment that the evidence is unlikely to be refuted. I will allow evidence to satisfy the claim if it establishes an extremely high likelihood of water (for example, no other known explanation) and over which there is no credible scientific controversy. The claim may be judged TRUE at any time that the conditions of the claim have been satisfied. The claim may be judged FALSE 3 months after the MERs are announced to be permanently inoperable without the conditions of the claim having been satisfied. I will discuss any proposed judgment on this list at least a week prior to closing the claim. I plan to judge this claim based on the intent. In order for a true jugement, I will require announcements by the MER teams stating that they have conclusive evidence of liquid water having existed. If there is some evidence, but it is either controversial within the community or not generally agreed to be conclusive, then that evidence is not sufficient for a TRUE judgement. 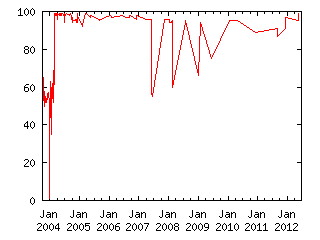 The mission profile for the rovers has them landing in January 2004 and operating for approximately 90 days, possibly more. In the event that the issue is still unclear as of the judging date, I may postpone judgement. I will use a combination of press releases from the MER teams, reports from reputable news sources (eg NY Times, Washington Post, BBC), and published journal articles (if available) to reach a conclusion.